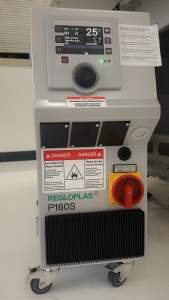 Regloplas, a Swiss supplier of Temperature Controllers, has provided a P160S pressurized water temperature control unit to the Polymers Center for applications when optimum heat transfer is needed. This TCU is used in conjunction with our Arburg 320A 55 ton Injection Molding Machine. Pressurized water units are safer and cleaner than oil units, and are more effective at removing heat when complex cooling designs are used including small baffles and bubblers. The P160S is capable of controlling temperatures up to 160°C (320°F), with a pumping capacity of 40 l/min. The unit also features a patented low-scale cooling system, innovative pressure control, leak-free pump with magnetic coupling, and solid-state relay instead of heating contactor. Contact us to learn more about what the Polymers Center has to offer. To take a look at a Regloplas P160S Flyer, click here.